As of June 1949 there were 1,858,000 television sets in use in America. That number has risen exponentially since September 1947 at the same time we came into the picture here with rock ‘n’ roll when just 44,000 TV sets were in households nationwide. More than just the raw numbers the speed of its penetration into society was what was of real significance. Television was gaining strength by the day and in the process ensuring it would be around for a long time. Like television, by the dawn of summer in 1949 new artists are arriving on the scene in rock at a steady pace and this is about the twentieth new name we’ve encountered since December, 1948, showing that the music’s rapid growth was in no danger of abating. There’s another corollary here with TV to make note of. Many of the early television programs were shows that were carried over from radio, the dominant form of entertainment over the past two decades, a trend that was quite natural and provided a ready made source for stars and story ideas to be easily adapted from one medium to another. In Eddie Williams we have a similar example of somebody making a transition from an older established genre of music to the new upstart style, another sign that rock ‘n’ roll had a creative and commercial allure that was going to be hard for ambitious artists to resist as time went on. Obviously there’s a lot to cover then in this review but let’s start with the man whose name is credited on the release itself and work our way out from there. Just who WAS Eddie Williams, you ask? Well truth be told he was somebody whose career to this point was hardly in need of a shot in the arm that an association with rock ‘n’ roll might give it. In fact of all of the artists we’ve encountered to date Williams probably had as much verifiable success prior to making his initial foray into rock as anybody, even if he wasn’t quite a big name in his own right. Williams, you see, was the bass player in Johnny Moore’s Three Blazers, the pre-eminent cocktail blues outfit in America over the past four years. Though Johnny Moore was the guitarist and leader of the trio he did not handle the vocals which is usually where the focus tends to fall in such groups. In The Three Blazers that role was taken by pianist Charles Brown whose laconic mellow baritone was among the most influential singing styles of the entire era. Williams helped anchor the sound on his bass since their breakthrough in the mid-1940’s but by late 1948 Brown had grown indignant at the lack of credit he’d been receiving and he left the Blazers after countless hits – Driftin’ Blues and Merry Christmas Baby being the most enduring – and began a solo career that would quickly overshadow Moore and company. At this very moment Brown was enjoying a #1 hit on the Race Charts, the biggest hit of the entire year in fact, with Trouble Blues. So with Moore’s group now in disarray for the time being it might’ve been an act of survival on Williams part to see if he could stir some action on his own to guard against his career winding down prematurely should Moore not be able to recover their clout with a replacement singer. Thus Eddie Williams formed the group The Brown Buddies, a truly reprehensible name, the kind of which was all too common in the era when the race of an act’s members often served as the source of the moniker that was affixed to them… as The Ink Spots, The Brown Dots, Three Chocolateers, even The Ravens (IE. “black birds”) can attest. Whoever’s decision it was, whether Williams himself or their label, there remains an onerous cloud that hovers over them which tends to obscure their output unless you forcibly detach the negative implications of the period it brings to mind. But since our job here is to focus on that output we’ll have to let its inappropriateness stand as its most damning criticism and move on to the music before we have time to let the affront of their name fester and risk having us dismiss them on sight. Besides, their story is too full of intrigue in other ways to consider bypassing them for era-related missteps and an unfortunate lack of judgment. The reason for this goes back to the unexpected nature of their emergence from The Three Blazers, a group that did indeed continue on – with Williams in tow – for years to come, recording concurrently alongside his work in this realm under this name. Making it all the more curious however is the fact that one of the replacements in The Three Blazers for Charles Brown’s seat on the piano bench and in the lead vocal role was, for a brief time, none other than Floyd Dixon, solo rock star for the next few years who also happened to be the lead singer of none other than… Eddie Williams And His Brown Buddies. It’d admittedly be rather hard to match the backstory of the group and its members, as well as the convoluted set of circumstances that led to their formation. But fear not because equally interesting is the way in which their song Houston Jump has a curious path of its own that gives additional insight into the tangled mass of names we’ve already mentioned in this review, as well as some others even further removed, all of whom would seem to be unconnected by musical backgrounds yet which find their influences and interests co-mingling in a variety of ways. The first – and most important – figure here isn’t Eddie Williams at all, his bass playing is barely noticeable (not bad, just not vital to the record) but rather Floyd Dixon whose stamp is on this in the most obvious way possible. Its theme. While both Williams and Dixon were from Texas and thus didn’t need a roadmap to find Houston the fact is Eddie Williams was in Los Angeles playing professionally with Moore since 1942 while Dixon only recently hit the coast from Lone Star state where he’d been haunting the Gulf Coast Region and soaking up the sounds. This is plainly evident by the entire sound of the record which owe a debt, if not a writing credit, to Amos Milburn… of Houston, Texas. Essentially this is a loose re-working of Milburn’s #1 hit from last fall, Chicken Shack Boogie. Dixon was an avowed fan of Milburn and that song was too big not to be imitated so you can hardly blame them for trying to score with it themselves. Now of course Milburn had been a popular fellow around Houston during the time that Dixon was coming of age further north and so it’s hardly surprising that Floyd would find inspiration in a slightly older figure who’d managed to make it out of the Texas nightclubs and head to the coast where – in due time – he became a national star. Yet Milburn himself had been a fan of… you guessed it… Charles Brown, late of The Three Blazers featuring Eddie Williams on bass. Somehow everything comes back around again. 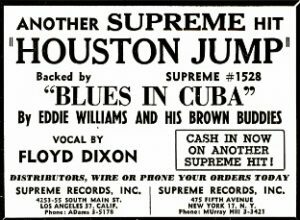 But in spite of having his former band member Williams ostensibly heading up the band here, Houston Jump doesn’t owe much to Brown, but rather its allegiance is with Milburn to the point of plagiarism. But as blatant imitations go it’s not half bad. Dixon knows his way around the keyboard, keeping up the swaying groove (hardly a “jump” no matter what the title suggests) and drawing out each vocal line to give it a sense of heightened anticipation and suspense. Not that anything happens in the story, mind you. It’s all just a pretty basic recounting of a night on the town, but the lines are effective enough to look these places up for yourself when hitting the Houston club scene for some action. Chances are you’ve been to plenty of the types of seedy dives and hole in the wall clubs before in some other city but Dixon makes the venues he’s spotlighting sound inviting by his mere vocal inflections and soothing tone and that effectiveness is the record’s primary drawing power, especially if you’re otherwise inclined to pass on obvious retreads of better songs you’ve already fully absorbed. But just when you think they won’t add anything new to Milburn’s established blueprint they surprise you, as the standout sound on Houston Jump winds up being the work of guitarist Tiny Webb who gets off some sharp licks, dominating the extended instrumental soloing that takes up most of the second half of the record. Because it’s missing the saxophone that defined Milburn’s records and features a more prominent guitar than Amos usually showed, something which harkens back in terms of focus at least – though not tone – to the work of Johnny Moore with The Three Blazers, you might be inclined to think this was Williams’s trying to fill the void that the momentary disintegration of that group had caused. That’s hardly the case though. The Three Blazers output was the epitome of cocktail blues, a slow, dreamy sound that emanated class far more than the ode to the barrooms Houston Jump is shaping up to be. This song clearly wasn’t aiming for the upper echelon status enjoyed by Charles Brown, but rather it was designed to take aim at the more unrefined rock audience pure and simple. By affixing their names to the prototype laid down by Milburn there’s no mistaking their intent and with Dixon’s skills at the forefront they’re not exactly hurting their chances by comparison. Obviously the utter lack of originality is a hindrance here but the added textures of the guitar and the all around quality of the composition (both Milburn’s original melody and delivery and the substitute lyrics they came up with) means that this is still fairly enjoyable to hear even if nobody would choose it outright over “Chicken Shack” if put to a vote. What is most promising however is the confluence of talents assembled here and what it represents in terms of rock’s ever-expanding potential as a genre. Dixon’s ultimate ascension to consistent – albeit somewhat minor – solo star is yet to be seen of course, but he did already have a hit to his credit in the pure blues realm with his debut from last winter, Dallas Blues, which we mentioned last month on his first offering in the rock field, also as a solo artist, on That’ll Get It. Just twenty years old he’d grow more confident in his own artistic direction in time and release some near-classics in a variety of styles but he’s already showing a clear affinity for this one, which bodes well for rock ‘n’ roll going forward. Williams of course had the reputation and the track record of success, albeit in the shadows of more publicized figures in The Three Blazers, but it’s telling that when he went out on his own to try and make a name for himself outside of that group he didn’t stick to the type of music he was most familiar with, and presumably most comfortable playing. Unlike Charles Brown who basically tackled the same type of material as a solo act as he did fronting The Three Blazers, Williams headed in another direction entirely, at least for the time being. All of this might be circumstantial if this were their only move in the direction of rock, something seen as a one-off somewhat cynical play for the market that Amos Milburn was defining which they appropriated because of Dixon’s own interest in it. If it was indeed a sound they’d move away from with their subsequent material you’d be right to dismiss their sincerity on Houston Jump, even as it’d still serve as evidence of the pull of rock’s growing popularity. But instead this only confirms what in retrospect was becoming obvious by this point in time, namely that rock itself was leading the way and providing any artist willing to cast their fate with the form a chance to succeed on par with more established styles, such as cocktail blues. It didn’t quite mean that they were dismissing those older forms entirely, in fact their only hit would come later in summer with Broken Hearted, a song that tried splitting the difference between the Milburn rock ballad model and cocktail blues, but they stuck pretty close to the rock field otherwise and maybe inevitably as more and more followed suit cocktail blues would enjoy its last few years as a commercial pillar of music before rock helped to push it aside completely. But that probably shouldn’t be a surprise, not when the practitioners of yesterday’s sounds were showing how amenable they were to the sounds of tomorrow. As radio stars were also discovering now that television was horning in on their exclusive claim to the nation’s interests… it sometimes pays to follow the old adage, “If you can’t beat ‘em, join ‘em”. Leave a reply on "Eddie Williams And His Brown Buddies: “Houston Jump”"